A Parish Profile for Sts. 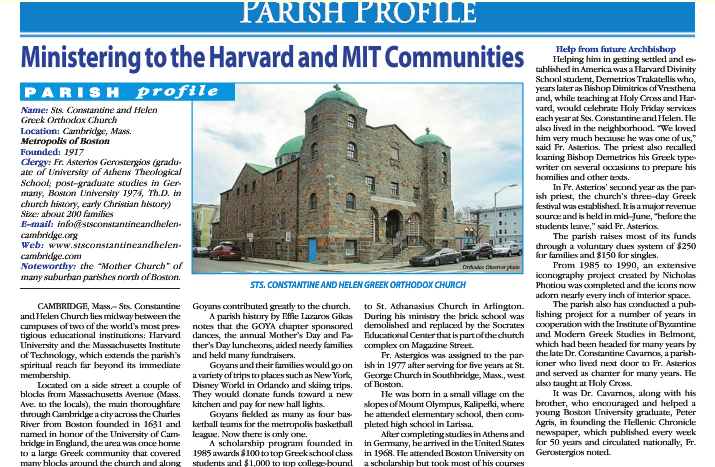 Constantine & Helen Greek Orthodox Church, Cambridge, Massachusetts was published in the May 2014 edition of the ORTHODOX OBSERVER - on page 21 of 32. The roots of the community go back to 1895, when the first five families settled in Cambridge from the Kalamata area. By 1910, the number increased to 100 and to 300 by 1916. Adding to their numbers were many immigrants from Mytilene. They established the parish in 1917 and rented a hall on Mass. Ave for $50 a month. Fr. Efstratios Righellis from Mytilene was brought in as the first priest. A year later, the community purchased the site of the present church at Auburn and Magazine streets for $9,500. An existing house on the property that was converted to a church served the parish until the present stone Byzantine-style edifice was completed in 1936 at a cost of $8,500. A small brick school was built adjacent to the church in 1921. . . .
About 20 years after the parish's founding, the members of Mytilenean background and those from Kalamata split over political and other disagreements. The Mytilene group, along with Fr. Righellis, then established Taxiarchae Church in Watertown.